Not many people have enjoyed a better rookie campaign inside the Octagon than Volkan Oezdemir. Debuting on the Super Bowl Saturday fight card in Houston in February 2017, the Swiss standout defeated Ovince Saint Preux on short notice in his first foray into the UFC cage before adding first-round stoppage wins over Misha Cirkunov and Jimi Manuwa in May and July respectively to establish himself as one of the top contenders in the light heavyweight division. Six months later and two weeks prior to the start of his sophomore year on the roster, Oezdemir faced off with light heavyweight champion Daniel Cormier in the co-main event of UFC 220 in Boston. Though he is pleased with his performance overall, the man known as “No Time” isn’t happy with how his first year wrapped and believes the way he put his goals out into the universe is partially to blame for the sour ending to an otherwise sweet rookie season. “It didn’t end up as I wanted, but I think I’m partially the one to blame,” says Oezdemir, who returns to action against Anthony Smith in this weekend’s main event at Avenir Centre in Moncton, New Brunswick, Canada. “I always said I wanted to have the fastest rise to the title and I was, but I think I put the words out there in the universe in the wrong way because my goal was to be the fastest one to become champion. Oezdemir’s second year on the UFC roster has been plagued by a series of false starts, as he was initially scheduled to face former champ Mauricio “Shogun” Rua in May before the bout was shuffled into the headlining slot in Hamburg, Germany two months later. Less than three weeks before the contest, the 29-year-old contender was pulled from the contest and paired with Alexander Gustafsson at UFC 227 instead, but that fight was quickly scuttled as well after Oezdemir suffered a broken nose in training camp. Now, nine long months after facing Cormier, he’s finally poised to return against the man who replaced him opposite Rua in Hamburg and used that opportunity to continue his own rapid ascent up the divisional ladder. “I think a lot of people have been underestimating him, which is how he’s come out on top a lot of times,” Oezdemir says of Smith, who scored a first-round stoppage win over Rua in Germany just six weeks after earning the same result against another former champion, Rashad Evans, in his light heavyweight debut at UFC 225 in Chicago. “He’s someone that can really upset a lot of people because nobody knew who he was and he did some great things beating two former champions. While it has taken far longer than anticipated for Oezdemir to make his second appearance of the year, the talented finisher has made the most of his time. He spent the duration of the last nine months in the United States, traveling to different gyms to get specialized instruction on various individual disciplines in order to sharpen his weapons in advance of his long-overdue return to action. “I stayed in the USA all this time; I wanted to train a lot,” says Oezdemir, who finished out his training camp at the Tristar Gym in Montreal. “I’ve also explored different aspects of the game that I wasn’t really training too much before. I went to Roberto Abreu to learn some jiu-jitsu and did some more intensive training in wrestling and some Muay Thai on the side, apart from kickboxing. I’m trying a lot of things and learning new skills and those are the weapons that I’m going to use in this fight. 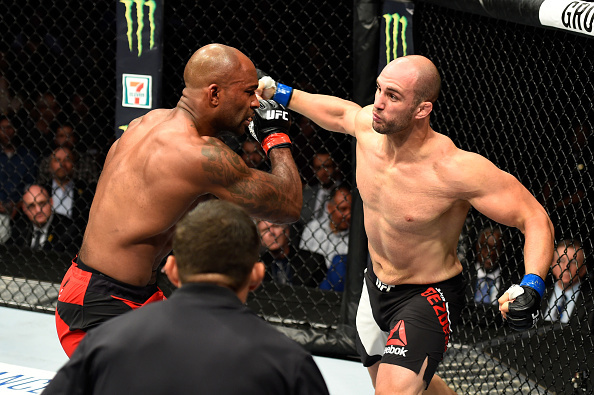 Although his first year on the UFC didn’t end with a championship victory, Oezdemir looks back on his bout with Cormier as an invaluable learning experience. He may have come away on the wrong side of the results, but he went through the most intense and professional training camp of his career and shared the cage with one of the top pound-for-pound fighters in the sport, both of which showed him elements he needed to work on and ways he could continue to improve. He has focused on those things for the last nine months as he’s navigated bouts being rescheduled and injuries forcing him to the sidelines and now he’s chomping at the bit to cross the threshold into the UFC cage and re-affirm his status as one of the top contenders in the reinvigorated light heavyweight division. “I think a win over Anthony puts me higher (on the list of contenders),” he says. “Right now, Gustafsson is going to be fighting for the belt, so he’s going to be staying No. 1 until that fight, but nobody else will be coming after me with a great performance on the 27th.